Here before you is one of the most delicious desserts and tops my list as my favorite summertime treat. I love it! And my husband knew that so he made it for me for Mother’s Day. The recipe is from my Aunt Marilyn, who you should know by now does not fail me in her recommendations. It is light and tart and sweet and absolutely divine. I could eat it every night for the rest of my life. And as soon as I publish this here post, I am about to go devour the rest in the freezer. Oh, by the way, the reason my pie looks sickly green (instead of vibrant and beautiful!) is because my husband had to substitute the zesty lemon sorbet (since our grocery store didn’t carry it – boo!) with passion fruit sorbet and it turned the ice cream filling brown (very bad!) so he doused it with some green food coloring. Normally, the pie looks more healthy green than fake green. 🙂 Delicious, nonetheless! For the crust, mix together all the ingredients and press into 9” springform pan. Freeze for 15 minutes. For the filling, soften the ice creams and yogurts and spoon into the crust. Sprinkle with toasted coconut. Freeze for at least 4 hours. Let stand 15 minutes before slicing. Serve with sliced limes on top. I knew I liked you, I got key lime pie for Mommy day too! Yummm! Pretty color 🙂 It makes it look more mint than key lime! Melanie, that pie looks amazing, just my kind of dessert! Great contest and congrats to the winner! I have been searching for a recipe for coconut halibut. One that would match the amazingness of the one they serve at Happy Sumo. Thanks to your contest, I have succeeded. My husband now thinks I am the most amazing wife ever. I found the recipe for sticky coconut chicken from one of the submissions for your contest, and I just substituted halibut for the chicken. If you haven’t tried this it should be the next one you try. Thanks for sharing. TaLaisa – Oooh, I bet the addition of limeade concentrate is FANTASTIC in this. Thanks for commenting – I hope you love the finished product! I love your blog! I have visited several times & thought it was about time I comment. Keep up the great work…I ALWAYS need new recipes! Mmm… it still sounds good, even if the colors weren’t what you were hoping for. TaLaisa – great idea to make this in a 9X13. I’ll have to try that next time. Glad it was a hit!! Grace – I’m so excited to send your package – congrats on winning!Jodee – I knew I liked you, too – the key lime pie just confirmed it. 🙂Annemarie – how sweet are you? Thanks for commenting. 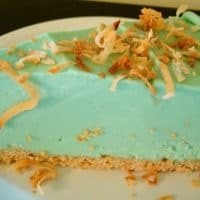 And now I’m glad because I can browse through all the yummy recipes on YOUR blog!Lori – thanks for your vote of confidence on the crazy color of the key lime pie. 🙂 Just keep in mind it was my husband’s work of art, not mine!Devron – I’m always willing to help any husband finally figure out they have an amazing wife! And I’m glad for the recommendation on the recipe. I can’t wait to try it and all the others from the contest post! Melanie, it was SO good. I made a 9×13 pan and served it at a family party. It was a hit! And best of all there were leftovers that I’m hiding for myself. Yum! I just finished making this. I’m a tart lime fanatic and added a little bit of limeade concentrate to up the lime factor. I haven’t tried it all together yet, but it was all I could do to keep from eating the filling with a spoon. Thanks for sharing this yummmmmy recipe! Hey, I kinda like the green color! Sounds great in any color. 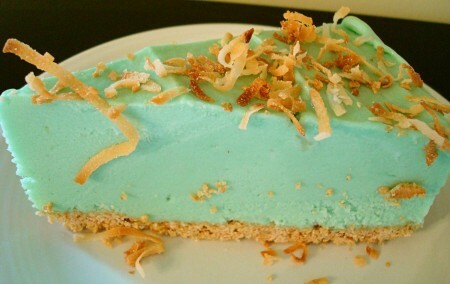 I have been collecting key lime recipes lately so will definitely add this one to the collection – can’t wait to try it! Thanks for sharing.